Why are OpenStack and Kubernetes interchangeable parts from some people’s perspectives, and potential companions in application management for others? The answer may lie in who’s asking: developers or system administrators. 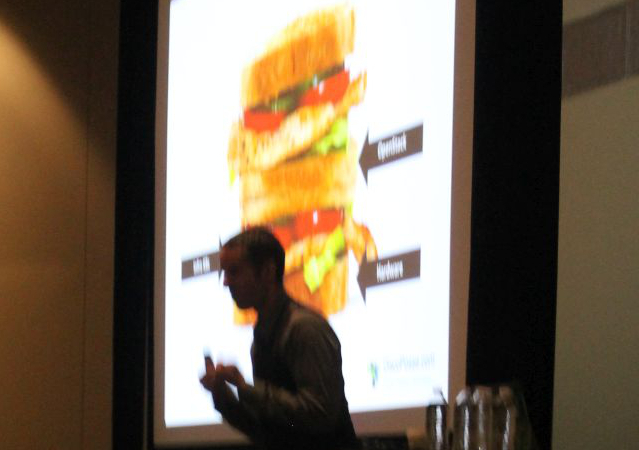 “This is the club sandwich part: There are my Kubernetes and developers’ Kubernetes, and never the twain shall meet,” declared Eric Wright, a solutions engineer with Toronto-based Turbonomic, speaking this week at the OpenStack Summit in Boston. Wright is a network engineer, not a developer. 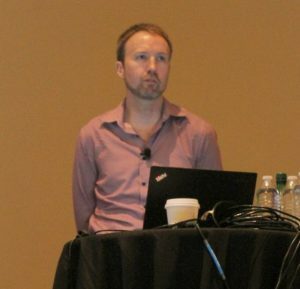 “Why combine the infrastructure-as-a-service and the application tier?” rhetorically asked Stephen Gordon, a principal product manager for Red Hat, speaking Monday afternoon during a breakout session at OpenStack Summit. “The way I think of it is in terms of exposition and consumption of resources. While Red Hat notices many of its customers running OpenShift ­­— Red Hat’s commercial distribution of Kubernetes — within virtual machines, including in the testing phase, Gordon said he believes this is a temporary state of affairs. 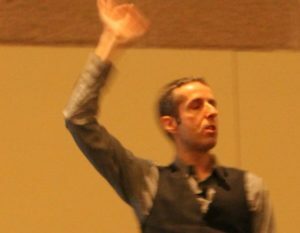 He told attendees to pay close attention to Wednesday’s keynote sessions, where engineers are expected to demonstrate dividing what he described as the OpenStack “monolith” into still-useful projects and less useful, with the survivor likely being Kubernetes managing applications on bare metal, in conjunction with OpenStack Neutron and OpenStack Cinder. Turbonomic’s Eric Wright is an advocate of a network environment where the Kubernetes open source container orchestration engine is wrapped around every component capable of running an application, including a first-generation virtual machine and including bare-metal servers. All those components are served by a common control plane established and managed by OpenStack. Then, the appearance of a conventional application environment for running almost any kind of software, of any age, can be established above the OpenStack layer. “You call it legacy. I call it production,” said Wright. Wright was making a much deeper implication — one which seems to be based on extensive personal experience. It’s also a much more important revelation than the architectural barriers between OpenStack and Kubernetes. The architecture of an organization’s networked applications is like a canyon being carved by rivers. We may be talking about neither Kubernetes nor OpenStack three years from now. But the way the applications we make today will work at that time, will most likely need to be preserved by whatever platform supports them. In the meantime, Wright gave three reasons why Kubernetes may be the right component for wrapping applications belonging to a OpenStack private cloud. As we mentioned earlier this week, reason #1 is that an organization does not have the spare hardware lying around to construct a new staging cluster for a production environment every time a developer project graduates from the testing phase. Thus, his second reason is to drive utilization, but particularly in those areas where utilization may be poorest. The third reason involves what he describes as an “on-ramp” that makes resources not just more easily consumable by users, but consumed in the more secure, preferred way that operators would prescribe. It was a problem addressed later in the day by Rackspace distinguished architect Adrian Otto, during a panel discussion about — what else — the intersection between OpenStack and Kubernetes. 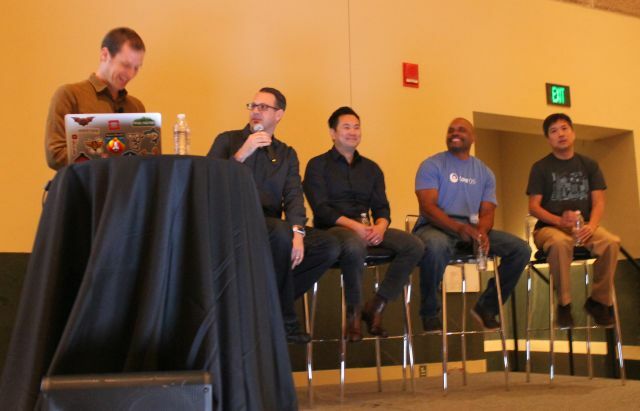 From left to right: OpenStack Foundation interop engineer Chris Hoge; Rackspace distinguished architect Adrian Otto; Comcast chief cloud infrastructure architect Jonathan Chiang; CoreOS training director Tony Campbell; Platform9 chief architect Bich Le. Two years ago, Otto was the principal advocate for OpenStack’s Magnum component — part of the platform’s initial effort to extend itself into the emerging world of container management. At that time, he told us, containerized applications “need a dedicated service that has an API intended only for the exclusive use of containers.” Now, it appears, Kubernetes has stepped in to fill that role. I asked Otto and the other members of the panel whether Kubernetes has actually relieved OpenStack of some of the responsibility for managing containerized applications. “I for one am relieved,” Otto responded with a sigh. Here are two principal open source components of the modern data center that are starting to make way for one another in distributed systems. What isn’t exactly clear just yet is which way or ways each one will cede to the other.